It seems that you're interested in enjoying an Alaskan cruise? If so, you have come to the right place, since on our website you'll find the answers to common Alaska cruise questions and you can explore all possible cruise options and their prices. We hope you would decide to book your cruise with us, as we offer low prices on all Alaska cruises and cruise tours, and provide friendly and expert support to plan every step of your journey. 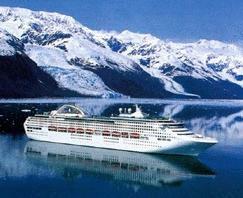 Alaskan cruises are an excellent way to go and see the great land known as Alaska. A growing number of people (more than 500,000 each year) decide to take a cruise instead of planning a personal trip to Alaska. The reason for this trend is the fact that cruise ships not only provide breathtaking views of various Alaskan scenes, but also provide great comfort and entertainment that compliment such views. Absolute majority of people on Alaska cruises love their trip, come back and recommend their friends and family to go as well.